As the world's population increases, cities grow larger and a view looking down at Earth from space shows that the lights from cities and towns across the world are not diminishing, but growing. Light pollution is blotting out all but the brightest objects from the nighttime sky. 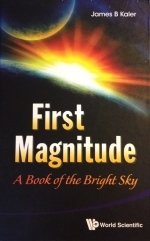 James B. Kaler's new book, First Magnitude: A Book of the Bright Sky, takes a look at each of the items that are or can be first magnitude objects, that is, those that shine between magnitude 0.51 and 1.50. While the title might give one the idea that the book is focused solely on observing from cities, in fact it is more of a primer on the basic facts behind the bright objects. The first chapters, dealing with the Sun, Moon, and classical planets, delve into a lot of territory that would be covered in elementary astronomy classes. We learn the reason for the seasons, the phases of the Moon, what terms like opposition, conjunction, and retrograde mean, and much, much more. The material in the first three chapters is useful to someone who is just starting to get his or her feet wet in astronomy. But Professor Kaler is a well-known star scholar at the University of Illinois, Urbana-Champaign, and the third and fourth chapters, entitled 'Sparkling Stars' and 'Bright Star', are where new information will start to filter in for most readers. Stars have gotten their names (and sometimes various names for one star) in different ways over the millennia. Different societies gave them different names and saw different constellations strung about them. Then the scientists became involved and used numbers and letters to systematically, though still not consistently, label each star. The types of each star and their lifecycles are also reviewed in this book before the sky's 23 brightest stars are looked at in detail. Each star has a story, some of which are well-known and some you may read about for the first time. Kaler gives us tons of tidbits to file away in our brains and march out for our friends the next time we are having a cocktail on the patio on a starry night. Did you know that Castor and Pollux, the Twins in Gemini, are not just a pair of stars but have their own families? Castor is not one star but six in orbit about each other, while Pollux has a planet circling it that is three times the size of Jupiter. Or maybe your audience would like to gaze at stars that may no longer exist as we see them now. Many of the brightest stars in our sky are ready to explode, and Deneb, Antares, and Betelgeuse, among others, may have exploded long ago but the light announcing their transformation has not reached us yet. One of the most interesting star tidbits of all to chew on is that those bright, first magnitude stars that catch our eye are not at all representative of what really exists in our galaxy. The vast majority of all stars in the Milky Way are red dwarfs, which cannot even be seen with the unaided eye. So the massive, luminous stars that rule the constellations we observe are basically anomalies in our galaxy. The final two chapters wrap up discussion of bright objects with meteors and comets, with information on annual showers and historical comets, and then an explanation of novae and supernovae. The 230-page book is a quick read for those who want to brush up on the solar system and learn more about the stars that beckon to us from the dark.